31 year old British man is restrained by a bar’s customers when they spot him stealing a woman’s purse. When the Police arrive, they find him to be holding a huge stash of drugs. Ed – This news is actually 2 weeks old – we didn’t get to it at the time, but as a definite addition to the ranks of Ibiza’s dumbest criminals, we couldn’t let it go by unreported. A 31 Year Old British man has been remanded in prison without bail following his arrest in a bar in Ibiza Town. Customers of the unnamed bar observed the man stealing the purse of a woman who worked in the bar. All credit to them, they stepped up and confronted the thief, restraining him whilst awaiting the Police. When they arrived, Police found the woman’s purse in the man’s bag and were able to return it to her complete and intact. Realising the man had left his bicycle outside the bar, the police looked inside a carrier bag he had left hanging on the handlebars. 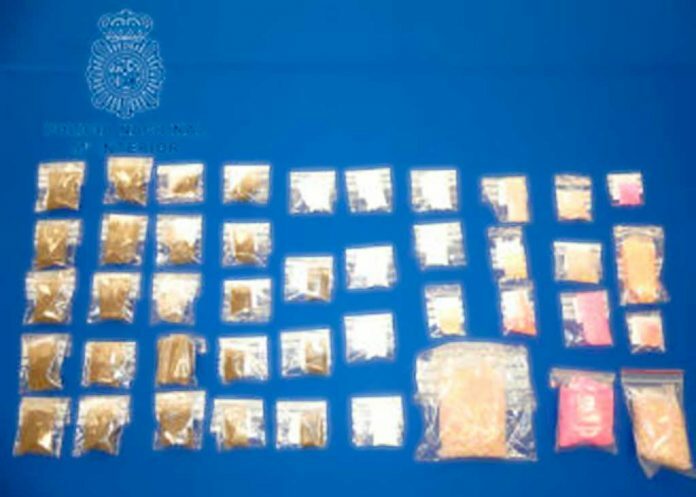 Inside they found 1,061 ecstasy pills, 63.1 grams of cocaine and 327.7 grams of crystal meth. Apparently, there were other types of drugs in the bag, perhaps peyote, although it will be necessary to wait for toxicology tests to know for sure. The National Police charged the man for the alleged commission of a crime against public health in the form of drug trafficking and another of theft, for the theft of the bag of the woman who was in the bar. Our British dumb criminal wasn’t alone in not adopting the principal of keeping a low profile while in possession of a large quantity of narcotics. In September 2018 a 25-year-old (we think Spanish) man driving in San Antonio was stopped by Police when they observed him using his mobile phone at the wheel. Noting his nervous demeanor, Police searched the car and found him to be in possession of 2 kilograms, yes that’s 2,000 grammes of crystal meth. Can you imagine if it was a wrong number?